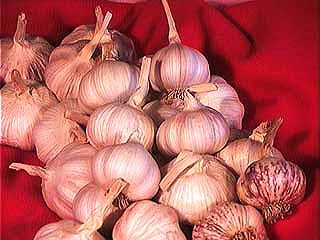 An early, rich, hot, strong Turban Garlic. Tzan -- Order now for shipping in the Fall. Tzan is a bit of a mysterious garlic in that there doesn't seem to be a clear picture of what it is as I have seen it described as an Artichoke though it is called a Turban but looks like an Asiatic. I have even seen one study that classified it as a Marbled Purple Stripe. Now that one of our growers is growing it for the first time, we hope to learn more about it this year. 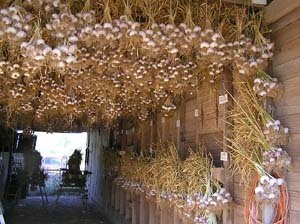 It is a very early harvesting garlic that comes at a time when good garlic is hard to find and is always a welcome presence. First, their flavor and pungency makes you say "Yowza" or whatever you say when you bite into something that is hotter than you thought it would be. Then you start singing or humming "Happy Days are here again"
Tzan is a garlic that harvests very early in the season. many form hardnecks and have some purple blush purple in rather flaky outer bulb wrappers that are easy to peel. The cloves are tannish with thin purple stripes and with slightly elongated tips. The bulbs contain an average of 12 cloves in an Artichoke-type pattern and have a few smallish but not tiny internal cloves - a more detailed description will come later. By all accounts the taste is hot and strong, with an earthy muskiness. Their rich flavor makes them very appealing. They are an early, tasty garlic that stores as well as any Asiatic or Turban as they want to get back into the ground in October and tend to sprout in the early fall.